I am a lifelong historian and former museum and historic house curator. My undergraduate and post-graduate studies focused on English social and cultural history with a concentration on the period of the late-eighteenth and early-nineteenth centuries. Truth be told, my choice of college curriculum was heavily influenced by all the novels by Jane Austen and Georgette Heyer which I began to devour as a young teen. I still periodically treat myself to re-reading novels by both authors. They have never lost their magic for me. My days as a curator are far behind me. I now manage testing of educational software for an international publishing company. But my delight in the study of history continues, and I persevere in my research into life in Regency England. Reading of modern Regency novels is intermingled with my history studies. However, I am sometimes irritated by the blatant historical inaccuracies in those novels. The Regency Redingote is my venue to attempt to set the record straight and perhaps to provide Regency authors with ideas for future novels. I like to think that Georgette Heyer would appreciate my efforts. I hope you will, as well. 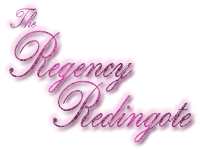 All content of the Regency Redingote, including all text and images, are the original work of Kathryn Kane and as such are all protected under copyright law. All rights to this content are expressly reserved. The content of The Regency Redingote may be accessed, printed or copied in unaltered form, only if the copyright is acknowledged, and only if the content is for the temporary use of personal study and edification. None of the content found here is to be copied, printed or otherwise appropriated for any direct or indirect non-commercial or commercial purpose. None of this content may be sold, licensed, transferred, copied or otherwise reproduced or manipulated in whole or in part in any manner whatsoever, without the prior written consent of the author. Requests for permission to reproduce any material from The Regency Redingote should be addressed to Kathryn Kane via her Gmail.com email box at Kathryn.K.Kane. Please forgive the lack of a complete email address, but humans can easily determine the correct email address, while I hope this format will foil the attempts of those dreadful mechanized email harvesters which scour the web seeking victims for their spam. This entry was posted in About and tagged Books, Georgette Heyer, Jane Austen, Regency. Bookmark the permalink.